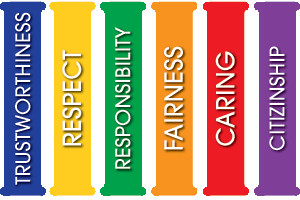 Character education includes and complements a broad range of educational approaches such as whole child education, service learning, social-emotional learning, and civic education. All share a commitment to helping young people become responsible, caring, and contributing citizens. ​Two students from each first grade, kindergarten, and special education classrooms are nominated by their teachers to receive the "Good character" award for that month. Once chosen, the students are recognized at the monthly character education assembly. During this assembly, each winner receives a certificate and prize and gets their picture taken to be hung up on the "wall of fame" bulletin board. Additionally, we ask these students to join us for "character cafe" where they have the opportunity to sit at a special table and eat treats provided to them by their school counselor.